The Burwell School Historic Site has dedicated 2018 to programs and exhibits observing the bicentennial of Elizabeth Keckly's birth. As young LIzzy Hobbs, she worked -- and all too often suffered -- as an enslaved servant in the household of Robert and Anna Burwell as they were establishing their academy for girls. 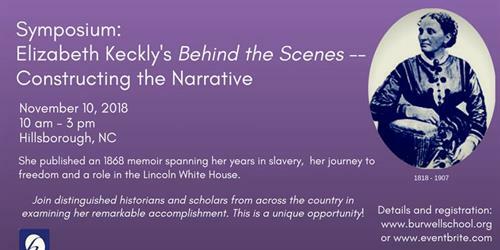 This symposium will bring together some of the most distinguished scholars to examine her 1868 memoir, Behind the Scenes, or, Thirty Years a Slave and Four Years in the White House -- a book that cost her Mary Lincoln's friendship. This slim memoir remains today both a compelling slave narrative, into the day to day economies and lives of the slaveholding South, and an invaluable insight into the private life of the Lincoln White House. Join us in Hillsborough for this very special event, sponsored by the Burwell School Historic Site. Registration is $20 and includes a boxed lunch. Make selection at checkout. Please contact us via email - symposium@burwellschool.org or call us at 919-732-7451. The Historic Hillsborough Commission is grateful to the NC Humanities Council for their support for this symposium through a Grassroots Grant and to the the Orange County Human Services Agency program and the Town of Hillsborough Tourism Program and for support of the mission of the Burwell School Historic Site. Registration is $20 and includes a boxed lunch.